One of David Wessels’ major concerns was that today’s kids – both urban and rural – had almost no idea how much the technology of agriculture changed in the last century. In David’s lifetime, farmers went from essentially a medieval system of plowing with horses to huge tractors run by computers with global positioning systems and air conditioned cabs. These technological changes caused a revolution in farming productivity and inexpensive food for all Americans. Education was David’s major goal in leaving his estate to the Wessels Living History Farm. 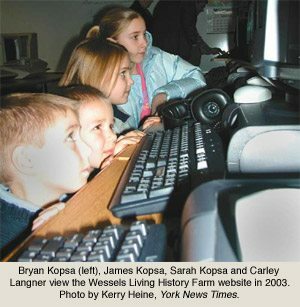 This Web site and the physical site south of York are both dedicated to education, both in the classroom and in homes. These Learner Resources, then, are designed to provide classroom teachers and students lesson plans that can be used in formal education situations. There are lesson plans that are tied to the stories for each major sections of the Web site. The Learner Resources from 1930 on are written by master teachers. Each is tied closely to Nebraska educational standards and have gone through a rigorous instructional design process. There are also lesson plans for several disciplines. Just select one of the sections above, select a discipline and look through the lesson plans. Click here for a list of other Web sites with information about agricultural history.